Everything you need to access and manage the AWS cloud — in one web interface. Get started fast with the AWS Management Console. All you need is an AWS account and a supported web browser. What can you do with the AWS Management Console? The console makes it easy to find new AWS services, configure services, view service usage, and so much more. From updating user groups to building applications to troubleshooting issues, with the Console, you can take action quickly. The Console offers over 150 services you can configure, launch, and test to get hands-on experience with AWS. With the Console’s automated wizards and workflows, it’s even easier to quickly deploy and test common workloads. There’s also a resource library featuring articles and tips from AWS experts, Getting Started tutorials, on-demand webinars, reference deployment templates, and more. Use the Console and its API, CLI, CloudFormation templates, and other toolkits to build scalable architectures in any AWS data center around the world. You can customize your experience by pinning favorites and organize projects with resource groups and the tag editor. Plus, you’re only one click away from the AWS Marketplace where you’ll find hundreds of popular software products that run on AWS. 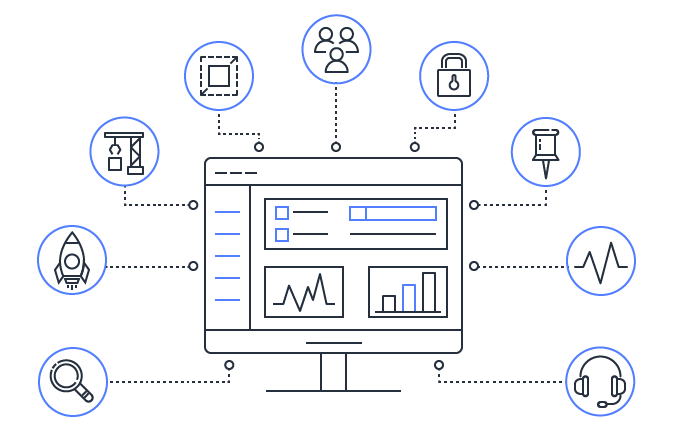 Oversee all administrative aspects of your AWS account from your desktop or mobile device. You can view your usage and monthly spending by service, set up AWS IAM users and groups, configure permissions, and manage security credentials. You can also quickly troubleshoot issues through visual monitoring. If you need extra help, submit a support ticket right from the Console to connect with an AWS expert. All you need is an existing AWS account and a supported browser. See our FAQs for a complete list of supported browsers and platforms. With the AWS Console mobile app, you can quickly and easily view your existing resources, including CloudWatch alarms, and perform operational tasks from your mobile device. Download our mobile app from Amazon Appstore, Google Play, or iTunes. *All IaaS AWS administration, management, and access functions in the AWS Console are available in the AWS API and CLI. New AWS IaaS features and services provide full AWS Console functionality through the API and CLI at launch or within 180 days of launch.